Archaeologists have discovered sophisticated stone tools in India dating back some 385,000 years. That’s all sorts of incredible, because Homo sapiens like you and me didn’t leave Africa until about 175,000 years ago. The discovery is resetting what we know about so-called “archaic” humans and the dramatic extent to which they spread out from Africa so very long ago. New research published in Nature suggests a Middle Paleolithic culture existed in India around 385,000 years ago, which is much earlier than previously thought. Also known as the Middle Stone Age, this stage of hominid development is characterized by the emergence of sophisticated stone tools, including fancy new blades, distinctive flaking and pointing methods, and a preference for smaller tools. Prior evidence had suggested the emergence of Middle Paleolithic culture in India to between 140,000 to 46,000 years ago, so the new discovery is causing a big rethink of conventional “Out of Africa” dispersion models and the kinds of cultures that existed in South Asia at this early stage in human history. When the first hominids left Africa some 1.7 million years ago, they were armed with a killer app known to archaeologists as the Acheulian hand axe, and it’s by this tool that the Acheulian culture is known. But like any technology, it eventually became obsolete as new, better tools become popular. The resulting shift from Lower Paleolithic Acheulian culture to the Middle Paleolithic, which happened between 300,000 to 200,000 years ago, signified a monumental transition for the human species, marked by the adoption of more sophisticated tools and manufacturing techniques. These cultures were primarily (if not exclusively) composed of “archaic” humans—an early branch of our species that included Homo rhodesiensis, Homo heidelbergensis, Homo antecessor, and Neanderthals. These early humans had a lot in common with Homo sapiens, like walking upright and having the ability to craft tools, but they differed in some subtle ways, such as differently sized skulls, prominent brow ridges, and shorter statures (except the Neanderthals, which, like our own species, had an average height of 5'3”). All of these human species eventually went extinct, but some interbred with anatomically modern humans, or Homo sapiens. Prior to the new study, archaeologists had found traces of many Middle Paleolithic sites in Africa, Europe, and the Middle East. Many sites have also been found in Asia, including India, but owing to a paucity of archaeological evidence, scientists haven’t been able to determine a date of origin. India in particular has presented a difficult case as fossils are hard to come by. The new study, led by Kumar Akhilesh and Shanti Pappu from Sharma Centre for Heritage Education, provides new evidence in the form of ancient stone tools excavated from the Attirampakkam archaeological site in southern India. Because no human fossils were found at the site, the researchers had to learn about the culture by tracking changes to their “toolkits” over time. In all, some 7,261 stone artifacts were pulled from the site, which is situated on the banks of a tributary stream of the Kortallaiyar River. The people who once called this place home used locally available quartzite to manufacture their tools. Using a technique called luminescence dating, Akhilesh and Pappu were able to document the trend away from Acheulian technology as it was gradually replaced by Middle Paleolithic tech. Luminescence dating measures the amount of light emitted from the energy stored in certain rocks and soils. It’s good for when radiocarbon dating is not possible (e.g. samples are too old), and it allows for the dating of artifacts rather than the organic material in which the items are found. 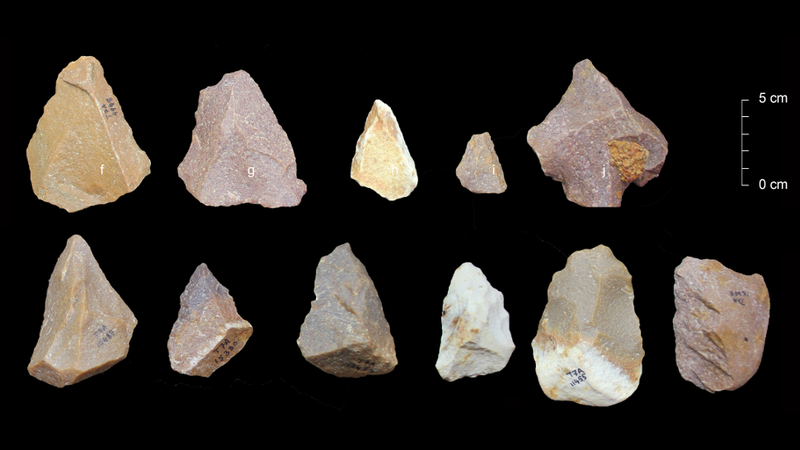 By studying the tools, the researchers documented a gradual shift away from the use of bifaces and other Acheulian large-flake technologies, and a shift towards smaller tools, and the use of distinctive and diverse Levallois flake and point strategies. The presence of Levallois tools is particularly interesting because their construction requires considerable foresight and planning. Acheulian hand axes were manufactured by hammering a piece of flint into a specific shape, but Lavallois tools required two stages of construction: knapping, or hand carving, a flint core into a specific shape, and then detaching the core with a single decisive strike. The builder has to imagine the tool’s final shape and size within the flint core before the shaping can begin. That requires some brains, so the discovery of Levallois tools shows how smart these “archaic” humans really were. Importantly, the study makes absolutely no mention of the kinds of human species that may have manufactured these tools. “Conclusive correlations between the Middle Palaeolithic assemblages at [Attirampakkam] and a specific hominin species—whether modern humans or archaic hominins—cannot be established because India currently lacks fossil or genetic evidence for this time period...” The earliest human-like fossil dating back to this period is the Narmada fossil, which was discovered in the central Narmada valley in Madhya Pradesh, India. The skull dates back to this time period, but the species to which it belongs remains unknown. The researchers say the discovery of these tools, and the associated technological evolution, establishes the presence of a “fully fledged Middle Paleolithic culture in India” at around 358,000 to 172,000 years ago. That’s a long time before Middle Paleolithic technologies were spread from Africa by modern humans around 175,000 to 125,000 years ago. Archaeologists and anthropologists still don’t know if Middle Paleolithic culture emerged spontaneously within India, or if its development was influenced by external factors, such as intermingling bands of hominids who exchanged cultural information. But it just so happens that Middle Paleolithic culture appeared at roughly the same time in Africa, Europe, and South Asia, a development that suggests archaic humans did in fact interact with each other during the course of these timescales. A weakness of this study is that the researchers utilized only one dating technique—a major limitation, given the extraordinarily old dates produced. The luminescence method is well established, but it would be good to see other dating techniques used to corroborate these findings. It would also be good to see the researchers constrain the estimated timespan, which is between 358,000 to 172,000 years ago—a large swing of 213,000 years. And finally, it would be good to find some human fossils (or other bits of archaeological evidence) to associate these stones to a specific human species—a big ask, to be sure, but more evidence is needed to back the claim being made in this study. These caveats aside, this is still a very exciting discovery. The mind boggles at the thought of ancient humans building their stone tools for thousands upon thousands of years before the first band of Homo sapiens finally ventured outside of Africa.